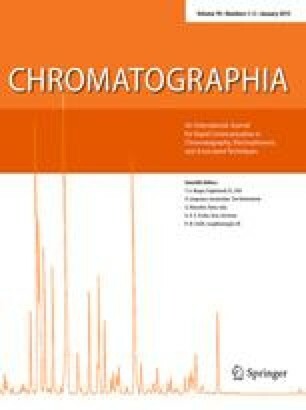 Reversed-phase, high-performance liquid chromatographic (RP-HPLC) methods with UV detection were developed and validated for determination of compounds in a topical cream. The first method describes determination of the active component clotrimazole and two preservatives present in the cream; methylparaben and propylparaben. The second method describes determination of two degradation products of clotrimazole, imidazole and (2-chlorophenyl) diphenylmethanol, in a topical cream after long-term stability tests. Chromatographic separation was on a Purospher RP-18e column; the mobile phase in Method1 for separation of clotrimazole, methylparaben and propylparaben comprises acetonitrile and water (70:30 v/v). For determination of degradations products-imidazole and (2-chlorophenyl) diphenylmethanol—the optimum composition of mobile phase in Method2 was acetonitrile and water (75:25 v/v) apparent pH* 2.7. Analysis time was <10 min for both methods. The methods were found to be applicable for routine analysis of the active compound clotrimazole, preservatives and degradation products in the pharmaceutical product: topical cream 1% Clotrimazol Cream.